Short answer: their sizes have increased a lot during the past 30 years. 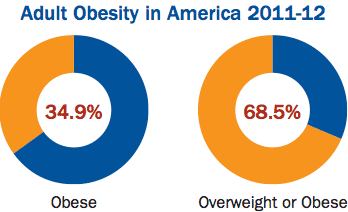 This is of importance because obesity is now considered to be an epidemic in many countries, particularly the USA. Indeed, for more than 20 years obesity has been seen as "the most challenging public health problem that we have faced" (Ref. 1). One of the things that is obviously associated with obesity is increasing consumption of energy-rich food; and one of the things implicated in increased consumption is the size of the portions being eaten — increased portions lead to increased energy intake, and if the energy is not immediately used then the person will put on weight. The relationship between obesity and the size of portions is a complex issue, which I will not go into here. However, for those of you who are interested, there are a number of recent literature reviews (Refs 2, 3, 4, 5, 6, 7). The experimental consensus is that people consistently consume more food and drink when offered larger-sized portions, packages or tableware than when offered smaller-sized versions. What is of particular interest for this blog post is that health professionals have been collecting data about increasing portion sizes over the years, and I thought that we might look at some of the data, and their consequences. Portion size is usually reported to be largest in the USA, and steadily increasing [Refs 8, 9], although data from Europe show similar trends — eg. Denmark (Ref. 10), the Netherlands (Ref. 11). People have now realized that there are two ways that increased portions have been happening, the first of which is related to hamburgers and the second of which is related to wine glasses. That is, food is often served as a discrete unit (Ref. 12), either as a single object (eg. a hamburger or a packet of crisps) or as a single serving (eg. a wine glass or a plate / bowl). Both units have been increasing in recent decades. For hamburgers, Ref. 13 found that a single McDonald's hamburger weighed 1.6 oz when first introduced in 1955 but in 2002 varied in weight from 1.6-8.0 oz, Burger King's weighed 3.9 oz in 1954 but 4.4-12.6 oz in 2002, and Howard Johnson's weighed 3.5 oz in the 1970s and 5.0-8.0 oz in 2002. These are hardly small increases. This is part of a general trend, in which the sizes of food products sold as a single package have increased through time. The next graph, from Ref. 14, shows the time when a larger unit size was introduced (ie. larger than when the product was first marketed) for a total of 181 different food products in the USA. The increase in portions has been rapid since 1980. Moving on to the other category, products sold "loose" (rather than in a fixed package size), the next graph, from Ref. 15, shows the capacity of wine glasses available in England over the past 3 centuries. Once again, the increase has been rapid since 1980. This is also part of a general trend, in which the sizes of other dinnerware have also increased through time. For example, Ref. 16 shows a similar graph of increasing size of dinner plates in the USA over the past century. This raises the obvious question of whether increased sizes of glasses has any affect on the amount of alcohol consumed. The general consensus seems to be "yes". Here, I will briefly discuss a few recent experimental studies about the wine glasses, tumblers, etc into which drinks are poured in licensed premises (restaurants and bars), rather than at home. Several years ago, the authors of Ref. 17 visited a number of bars in California, to check whether the wines, mixed drinks and straight drinks varied in alcohol level based on the size or shape of the glass it was served in (due to variation in the bartender pouring). They concluded that: “Straight shots and mixed drinks served in the relatively large pint glass ... were found to contain more alcohol than drinks served in a short wide glass. No other significant differences were found between glass types.” That is, in this situation wine glass size and shape made no difference. So, serving people in over-sized glasses led them to purchase more glasses of wine. It is worth looking at how this effect is assumed to work. The Delboeuf Illusion is usually considered to be the prime force, as shown in the next picture (from Ref. 16) — the plate on the left looks like it has less food, even though the two amounts are identical. The same is true of the two wine glasses shown above — if it looks like you are drinking less per glass, then you buy more glasses. This idea was experimentally tested by the authors of Ref. 20, who asked their participants to fill a second glass with the same amount of wine as was present in the first (standard) glass — the second glass was either wider or taller or both, compared to the reference. The authors concluded that: “Participants under-filled the wider glass relative to the reference glass and and over-filled the larger glass relative to the reference glass. These results are broadly consistent with people using the relative fullness of glasses to judge volume, and suggest both the shape and capacity of wine glasses may influence perceived volume.” A similar conclusion was reached by the authors of a similar but much earlier study (Ref. 21). However, these same authors (Ref. 22) also tested a different idea in the laboratory, that the effect might be produced by differences in drinking behavior — drinking rate, sip number and sip duration might be increased for larger glasses. Sadly, they found that: “Wine drunk from the larger, compared with the smaller glass, was consumed more slowly and with shorter sip duration, counter to the hypothesised direction of effect.” This might be due to the participants drinking alone in a laboratory rather than socially in a bar / restaurant. However, for lager consumed from straight-sided versus curved beer glasses, the authors of Ref. 23 found that: “Participants were 60% slower to consume the alcoholic beverage from a straight glass compared to a curved glass. This effect ... was not observed for a non-alcoholic beverage. Participants also misjudged the half-way point of a curved glass to a greater degree than that of a straight glass.” So, glass shape mattered. This inevitably leads us to consider the affect that of all of this research might have on marketing. Because the actual food and drinks are usually only a small percentage of the cost of eating and drinking, giving customers a larger portion is a strategy that might increase total sales. This leads to the widespread practice of “super-sizing” — giving customers a lot more food (and calories) for only a small additional cost. This seems to be the main motivation for sellers increasing their food portions, as described above. "portion distortion" — larger portions can be perceived as an appropriate amount to consume on a single occasion, due to continuous exposure to larger food portion sizes. These two ideas combine, because people tend to "clean their plate" when given a particular portion of food — they consume what they are served, no matter how much (or little) it is. So, it does seem that the drinks business is actively involved in the current obesity epidemic. There are "standard portions" described for many foods, usually based on daily diet requirements or other health considerations. For example, in the USA these standards are provided by the Food and Drug Administration (FDA), the Department of Agriculture (USDA), and the Centers for Disease Control and Prevention (CDC). These portions are often listed as "standard servings" on packaged food. Although a "standard drink" is defined in terms of the amount of alcohol it contains, most people have little idea about what constitutes a standard drink in terms of volume, irrespective of whether it refers to wine, beer or spirits. In the experiment conducted by the authors of Ref. 25, almost all of the participants poured a drink that was too large. Unfortunately, the so-called “standard drink” can vary considerably among countries. For example, in the USA a standard drink contains 14 g (0.6 oz) of ethanol, which would be 150 mL (5 fl. oz) of 12% ABV wine. However, in Australia, the standard drink contains only 10 g of ethanol, which is equivalent to 105 mL of wine. So, a bottle of 12% wine in the USA is considered to contain 5 standard drinks but in Australia it contains 7 such drinks. Obviously, with increased alcohol strengths of wine in recent years there are even more standard drinks per bottle these days! Barbara J Rolls (2003) The supersizing of america: portion size and the obesity epidemic. Nutrition Today 38: 42-53. Ingrid HM Steenhuis, Willemijn M Vermeer (2009) Portion size: review and framework for interventions. International Journal of Behavioral Nutrition & Physical Activity 6: 58. M Barbara E Livingstone, L Kirsty Pourshahidi (2014) Portion size and obesity. Advances in Nutrition 5: 829-834. E Robinson, S Nolan, C Tudur-Smith, EJ Boyland, JA Harrold, CA Hardman, JCG Halford (2014) Will smaller plates lead to smaller waists? A systematic review and meta-analysis of the effect that experimental manipulation of dishware size has on energy consumption. Obesity Reviews 15: 812-821. David Benton (2015) Portion size: what we know and what we need to know. Critical Reviews in Food Science and Nutrition 55: 988-1004. Gareth J Hollands, Ian Shemilt, Theresa M Marteau, Susan A Jebb, Hannah B Lewis, Yinghui Wei, Julian Higgins, David Ogilvie (2015) Portion, package or tableware size for changing selection and consumption of food, alcohol and tobacco. Cochrane Database of Systematic Reviews 9: CD011045. C Peter Herman, Janet Polivy, Lenny R Vartanian, Patricia Pliner (2016) Are large portions responsible for the obesity epidemic? Physiology & Behavior 156 177-181. Samara Joy Nielsen, Barry M. Popkin (2003) Patterns and trends in food portion sizes, 1977-1998. Journal of the American Medical Association 289: 450-453. Helen Smiciklas-Wright, Diane C Mitchell, Sharon J Mickle, Joseph D Goldman, Annetta Cook (2003) Food commonly eaten in the United States, 1989-1991 and 1994-1996: are the portion sizes changing? Journal of the American Dietetic Association 103: 41-47. Jeppe Matthiessen, Sisse Fagt, Anja Biltoft-Jensen, Anne Marie Beck, Lars Ovesen (2003) Size makes a difference. Public Health Nutrition 6: 65-72. Ingrid HM Steenhuis , Franca H Leeuwis, Willemijn M Vermeer (2010) Small, medium, large or supersize: trends in food portion sizes in The Netherlands. Public Health Nutrition 13: 852-857. Andrew B Geier, Paul Rozin, Gheorghe Doros (2006) Unit bias: a new heuristic that helps explain the effect of portion size on food intake. Psychological Science 17: 521-525. Lisa R Young, Marion Nestle (2003) Expanding portion sizes in the US marketplace: implications for nutrition counseling. Journal of the American Dietetic Association 103: 231-234. Lisa R Young, Marion Nestle (2002) The contribution of expanding portion sizes to the US obesity epidemic. American Journal of Public Health 92: 246-249. Zorana Zupan, Alexandra Evans, Dominique-Laurent Couturier, Theresa M Marteau (2017) Wine glass size in England from 1700 to 2017: a measure of our time. British Medical Journal 359: j5623. Koert Van Ittersum, Brian Wansink (2012) Plate size and color suggestibility: the Delboeuf Illusion’s bias on serving and eating behavior. Journal of Consumer Research 39: 215-228. William C Kerr, Deidre Patterson, Mary A Koenen, Thomas K Greenfield (2009) Large drinks are no mistake: glass size, not shape, affects alcoholic beverage drink pours. Drug and Alcohol Review 28: 360-365. Rachel Pechey, Dominique-Laurent Couturier, Gareth J Hollands, Eleni Mantzari, Marcus R. Munafò, Theresa M Marteau (2016) Does wine glass size influence sales for on-site consumption? A multiple treatment reversal design. BMC Public Health 16: 390. Rachel Pechey, Dominique‐Laurent Couturier, Gareth J Hollands, Eleni Mantzari, Zorana Zupan, Theresa M Marteau (2017) Wine glass size and wine sales: a replication study in two bars. BMC Research Notes 10: 287. Rachel Pechey, Angela S Attwood, Dominique‐Laurent Couturier, Marcus R Munafò, Nicholas E Scott-Samuel, Andy Woods, Theresa M Marteau (2015) Does glass size and shape influence judgements of the volume of wine? PLoS One 10: e0144536. Brian Wansink, John S Dyson, Koert van Ittersum (2005) Shape of glass and amount of alcohol poured: comparative study of effect of practice and concentration. British Medical Journal 331: 1512. 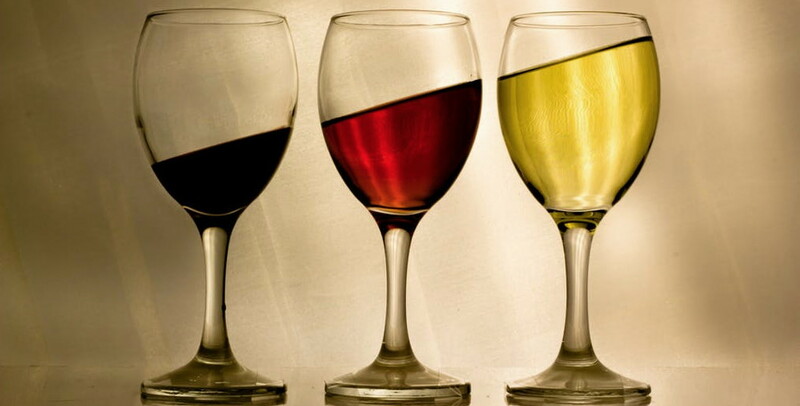 Zorana Zupan, Rachel Pechey, Dominique‐Laurent Couturier, Gareth J Hollands, Theresa M Marteau (2017) Micro-drinking behaviours and consumption of wine in different wine glass sizes: a laboratory study. BMC Psychology 5: 17. Angela S Attwood, Nicholas E Scott-Samuel, George Stothart, Marcus R Munafò (2012) Glass shape influences consumption rate for alcoholic beverages. PLoS One 7: e43007. Martine Stead, Kathryn Angus, Laura Macdonald, Linda Bauld (2014) Looking into the glass: glassware as an alcohol marketing tool, and the implications for policy. Alcohol & Alcoholism 49: 317-320. Aaron M White, Courtney L Kraus, Lindsey A McCracken, H Scott Swartzwelder (2003) Do college students drink more than they think? Use of a free-pour paradigm to determine how college students define standard drinks. Alcoholism: Clinical & Experimental Research 27: 1750-1756. This is just a short note about something that I encountered during the past year. Academic researchers often repeat very similar experimental work under different circumstances, often several years apart. They then then publish these works separately. When writing the later manuscripts, it is quite common to copy the description of the experiment from the earlier manuscripts. After all, to do otherwise would be to re-invent the wheel — if you got the description right the first time then you cannot do better by re-writing it. However, one does have to remember to change the description of those parts that differ between the experiments. The nightmare that we authors have is that we will forget to do this! The data collection and analysis were the same in both cases, and so the published descriptions are almost identical. Unfortunately, they are a bit too similar. "The experts were then asked to give marks for the quality of the wine and an indication of the extent to which it can be laid down (for red and Sauternes wines only)." "The experts were then asked to give notes for the quality of the wine and an indication of the extent to which it can be laid down (for red and Sauternes wines only)." The reference to Sauternes makes sense when you are writing about Bordeaux wines, as in Paper 1; but it does seem out of place in a paper about wines from Alsace, Beaujolais or Provence, as in Paper 2. Almost all authors will have done this at some time — the trick is to catch the error before anyone else does. Last October there were, as many of you know, a few unexpectedly large fires in some parts of California. Indeed, the entire 2017 fire season was worse than usual (see 2017 California wildfires); and Wildfires are burning longer and hotter each year). Naturally, this attracted a lot of media attention, in the "wine and vine" media as much as anywhere else, since the fires occurred in a well-known vineyard area. This seemed to distract attention in the USA away from the equally bad 2017 fires in Portugal (although see Decanter's report Deadly fires hit wine regions in Spain and Portugal). There were two lots of fires, actually. The first one was a firestorm in June in the Pedrógão Grande area of central Portugal — at least 65 deaths and 204 injuries, followed by three days of national mourning (see June 2017 Portugal wildfires). The October fires, on the other hand, involved a series of several thousand fires spread throughout much of northern Portugal and north-Western Spain (see October 2017 Iberian wildfires) — at least 45 deaths in Portugal and dozens of injuries. 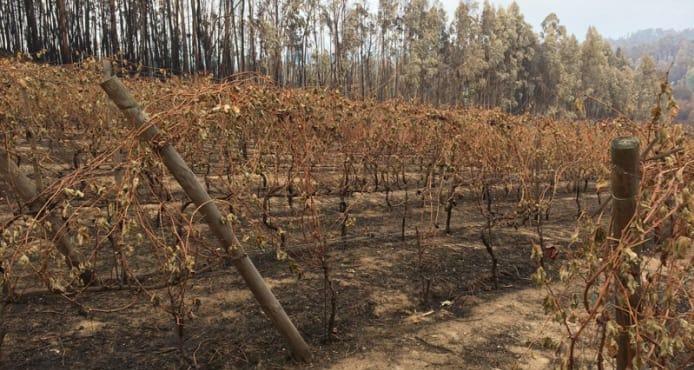 I am not sure that any vineyards were directly affected by the June fires, but some of the October fires had their effect, especially in the Dão viticultural region of northern Portugal. One of the purposes of this blog post is to draw your attention to a Portugese winery that is adopting an innovative way of recovering from their October fire. This is Casa de Mouraz, a pioneering organic/biodynamic winery near Tondela, in the south-western part of the Dão region. It is a family business, run by husband and wife team António Lopes Ribeiro and Sara Dionísio. Sarah Ahmed provides a brief introduction to the winery and its wines (Catching up with the organic wines of Casa de Mouraz). Some of you may have encountered their wines, as reportedly 98% of the production is exported. 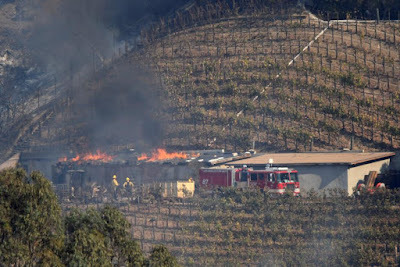 Casa de Mouraz was badly affected by a fire on October 15, which burnt 50% of the vineyards, damaged some of the equipment, and destroyed part of their wine store and its contents. Quinta dos Roques, further east, was another winery that was severely affected on the same day (see Rising from the ashes, the Dão’s phoenix 2017 vintage). The strategy for Casa de Mouraz to bounce back has been to start an Indiegogo campaign — Casa de Mouraz wines 2.0 - Rising from the ashes. They are seeking €100,000 to get started on their long-term plan, which will ultimately cost an estimated €600,000. You can read about their plans (and the rewards for donors) on the campaign page. The ultimate cause of the Portugese fires is a simple one, and it is the same as the one in California — eucalypts and pines don't mix. Well, they do, actually, but in an extremely volatile manner when the weather gets warm. Trust me — I grew up in the homeland of the eucalypts, so I know exactly what they can do when they get a bit hot and dry. Indeed, the affect of fire on native plants is what I used to study as a scientist when I lived in Australia; so I have a personal as well as professional interest in this topic. Eucalypts occur near many vineyard areas. From their native Australia, they were transplanted during the 1800s to all continents except Antarctica, into almost all climates where they will grow. Indeed, it's a long time since I traveled anywhere in the world without seeing a eucalypt or two. People thought that they "would cure malaria, solve the drainage problems that defeated Roman emperors, fill the Sahara with forest, and reveal the presence of gold" (Ashley Hay. 2002. Gum: the Story of Eucalypts and their Champions). As a consequence, in many places eucalyts have actually replaced the native shrublands and woodlands. They are used as a valuable source of hardwood in areas that either lack native hardwood species, or where such species have been removed. They can be used as a cash crop, for example for paper production, building timber, railway sleepers, telegraph poles, etc. The main point is that the eucalypts can deal with fires rather easily. After fires, the Australian media always used to ask: "when will the burned forest come back? "; and the botanists always tried to patiently explain that the native plants hadn't gone anywhere — they were still there, still alive, and ready to regrow as soon as the rains came. Fire is a natural part of their life. But it isn't a natural part of most agricultural systems, least of all vineyards. Therefore, while it is obviously important for the affected agricultural areas to recover from the effects of the 2017 fires, it seems to me to be equally important to think about the future, in terms of prevention. We need to be proactive not just reactive. Fires in what are called Mediterranean-type climates (hot dry summers and mild wet winters) are to be expected — they cannot be avoided, for basic climatic reasons. Nor can fires be excluded from areas with natural Mediterranean-type ecosystems — fire is a normal part of such systems. Indeed, in those parts of Europe, North America, South America, Australia and South Africa that have such ecosystems (see the map), the plants naturally take it in their stride. 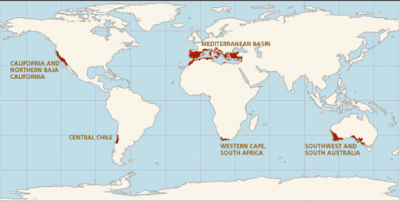 You may not have realized it before, but the map shows you that much of the world's fine-wine viticulture actually occurs in areas with Mediterranean-type ecosystems. The natural vegetation of these ecosystems are shrublands with small trees, variously referred to as heaths, maquis (France), macchia (Italy), matorral (Spain, Chile), chaparral (California), kwongan (south-west Australia) and fynbos (South Africa). This native vegetation is highly flammable, and most of the indigenous shrubs (and trees, when they occur) actually require fire as part of their life-cycle. So, in all of these cases avoidance of fires cannot be our agricultural management strategy, if we care about biodiversity, because recurrent fires are a natural component of that biodiversity. And, after all, isn't the whole point of biodynamic agriculture to care about biodiversity, while producing high-quality agricultural products? That leaves us with survival as our basic strategy, just as it is for the native plants and animals, which re-emerge with aplomb after a fire. Vineyards and wineries in fire-prone environments thus need to be able to withstand recurrent fires. We don't know when or where the fires will occur, but we do know that they will eventually come in all Mediterranean-type ecosystems, whether they are deliberately lit or not. When they do come, the vineyards and wineries must be ready — not just as single entities but as a group. Hoping to escape fires is not a viable strategy any longer. It seems to me that not much thought has yet been given to this topic. There are many possible components of a such a strategy, including winery design and vineyard management, which I will not go into here. However, perhaps the deepest thought needs to be given to the necessity of having non-native trees such as eucalypts inter-mixed with vineyards. The natural vegetation of Mediterranean-type ecosystems is flammable on its own, and yet into this environment we have actually introduced eucalypts, the most flammable trees on earth. It seems to be the height of silliness to have them in fire-prone areas containing vineyards. All this does is make a potentially bad situation infinitely worse. Vineyards are usually capable of withstanding relatively mild fires (see Months after Wine Country fires, damaged vineyards face uncertainty), but they cannot survive a severe eucalypt-propagated wildfire. We cannot keep relying on insurance policies and crowd funding for the long-term fire management of the affected viticultural areas. For 200 years Bordeaux was the red wine capital of the world, and its wine styles and prices set the standards for the international wine market. But in the last 10 years ... California [has] created its own wine kingdom with a quite different aristocracy and legislature. The wines themselves may be made from the same Cabernet and Merlot grapes as red Bordeaux but they taste quite different ... Most of these California cult Cabernets carry names which were unknown 10, sometimes 5 years ago. But they are made in such small quantities ... that prices have overtaken those of Europe's established classics. Nothing much has changed since then — compared to the top Bordeaux wines, the California cult wines still taste different and they still cost more money. However, an obvious question to ask is: does the difference in wine style result in different quality scores? Alternatively: are the higher prices reflected in higher scores? To answer this, we can ask Jancis Robinson herself. In her article, she provides "an extraordinary assessment of the cult wines that cost more than Bordeaux's first growths", by tasting and scoring 34 wines of "seven of California's best Cabernets old and new" — 4-6 wines per winery, covering the 1990-1997 vintages. For comparison, I have collated her scores for seven top Bordeaux producers, covering the same vintages. This is actually a bit tricky, because the 1991-1994 vintages were poor, and most chateaux have no Robinson scores for these years. However, I managed to get scores for each chateau for 1989-1990 and 1995-1997 — I chose the score that was dated closest to a 2001 tasting (which may somewhat disadvantage the Bordeaux wine style). Robinson uses a 20-point scale, including half points. Her scores for the 69 wines are shown in the graph, where each dot represents one wine score. The 34 scores for the California wines are grouped on the left, and the 35 scores for the Bordeaux wines are on the right. Obviously, there is not much difference in the scores between the two wine groups, although there are more scores of 17.5 for the California wines versus 18.5 for the Bordeaux wines. However, a statistical analysis (2-factor nested analysis of variance) shows that this difference is no more than would be expected by chance. Indeed, this analysis shows that 71% of the variation in quality scores is actually due to vintage differences, with a further 27% being due to differences between the individual wineries, and only 2% of the variation attributable to California versus Bordeaux. Most of the wineries have average quality scores within a fairly narrow range, with nine of them scoring averages of 17 to 18. 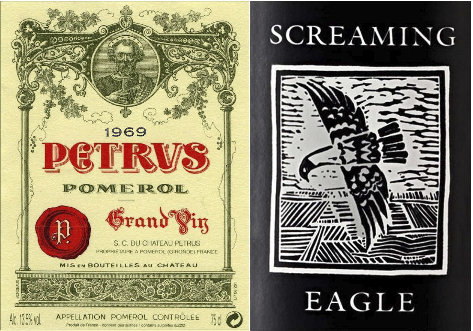 However, the two Left Bank Bordeaux wineries have an average score of 18.3 (Cheval Blanc) and 18.6 (Petrus), and California's Screaming Eagle is at the top with 18.9. At the other end are two of the other California wineries: Dalla Valle Maya (average 16.2) and Harlan Estate (16.9). So, it seems that, at least as far as Jancis Robinson is concerned, the fact that the California wines are "exuberantly fruity and ready to enjoy at what a European might regard as an almost obscenely young age" does not affect their standing in the points-scoring race. This means that their extra price is not determined by any extra quality. Presumably, the price is set, instead, by their relative scarcity — the cult California wines have hundreds of cases produced per vintage, whereas the Bordeaux wines generally have thousands of cases produced each year, and in some instances tens of thousands. This is a season when many people take a drink or two, irrespective of whether they do so at other times of the year. However, many countries make either no wine or very little wine, in which case they need to import whatever wine their people require. Other countries make only certain types of wine (often for climatic reasons), and they need to import the remainder. Alternatively, some very populous countries currently have almost no requirements at all for wine, either home-grown or imported, at least relative to their population size, including India, Indonesia and Pakistan. However, there is also one wine-producing country that nevertheless still imports a lot of wine: the United States of America. The data that illustrate this come from Comtrade, the United Nations International Trade Statistics Database, as reported on a couple of American Association of Wine Economists' Facebook pages (here and here). The data are shown in the first graph below, where each point represents one of the 20 countries that imported the greatest volumes of wine during 2016. The horizontal axis is the volume imported (in thousands of tons) and the vertical axis is the average price per liter in US dollars. I have labeled the four countries that imported the greatest volume, as well as the four that paid the highest average price. As you can see, only the USA is in both of these top-four groups. The UK and Germany import lots of wine, because they have large populations but make only certain types of wine themselves. In both cases, they specialize in producing white wine, as it is hard to make high-quality red wine in their marginal grape-growing climates. So, they import wines across a wide range of prices, which means that the average price is in the middle. Germany, in particular, does not need to import expensive white wine, as they have plenty of their own. However, they are the world's biggest importers of bulk wine, principally from Italy, Spain, France and South Africa (see Top bulk wine routes in 2000 and 2015). Japan, Sweden and Switzerland make very little wine at all, although all three do have commercial wine producers. So, they import almost all of their requirements, from the cheapest to the most expensive, The graph suggests that they focus on higher-priced wines, rather than on the cheapest stuff. The presence of France as a big importer of cheap wines often seems odd, because the French have plenty of inexpensive wine of their own. It has been pointed out that "tanker trucks [might] explain how France 'produces' much more wine than Spain despite having a lot less vineyard acreage" (Is some French wine really from Spain?). Behind only Germany, France is actually one of the world's biggest importers of bulk wine — it used to import most of its bulk wine from Italy (and before that from Algeria), but it now relies predominantly on Spain (Top bulk wine routes in 2000 and 2015). However, in most other cases the wine volume imported presumably depends on the population size of the country, rather than the number of tanker trucks — countries with more people are likely to have a greater requirement for wine. After all, the USA is the world's third most populous country (after China and India), and even a small amount of wine per person would add up to a lot of wine. So, we should also look at the wine volume imported per person. The 2017 population data can be taken from the WorldoMeters web page. The next graph shows the same data as above, but now the horizontal axis is the volume imported in liters per 1000 people (ie. total volume divided by population size). The pink dashed lines simply divide the horizontal and vertical axes into three sections, thus creating nine segments, to aid discussion. Note that two of the nine squares are empty — none of the big importers focus solely on the cheapest wines (the bottom-right corner), nor does anyone in this group import middle quantities of average wine price. With this re-calculation, the UK remains as a big importer of wines across all price ranges, but it is now joined by Belgium, Ireland and the Netherlands. Like the UK, the latter three countries also produce only small amounts of wine, and so they must important almost all of their requirements for all wine types. Sweden moves up into a middle position as a wine importer of expensive wines, while Switzerland moves well ahead into first place. Presumably, the Swiss simply consume more wine per person than do the Swedes. We may need to also compare their beer and spirits consumptions, to get the full picture here. Canada joins Sweden in the middle position, as they make only a limited range of wines. Japan remains as a small importer of expensive wines, and is now joined by the USA, moving well down the list. Presumably, the USA needs to import foreign wine only at the expensive end of the market— there is no real need to import the cheap stuff, as the market for inexpensive and middle-priced wines can easily be met by the local produce. It is, perhaps, interesting to note that this basic idea (supply the cheap stuff locally and import the expensive stuff) cannot be assumed for all alcohol products. For example, the USA is the world's biggest market for Cognac brandy, by volume. However, the key driver in this market is VS Cognac, the cheapest sort, where sales are reported to be dominated by African-Americans. The biggest market for Cognac by value, based on a preference for the luxury products, is China (see Global Cognac sales set to continue growth trend). Returning to our graph, Germany drops down the list as an importer of cheap wine, and is joined by Czechia (see Czechia has won the Czech Republic name debate) and Portugal. The Czechs are reported to drink more beer per capita than any other country (see Wikipedia), and so maybe they are not great drinkers of wine of the expensive type. The position of Portugal is more problematic, because they produce a lot of inexpensive but very good wine of their own. Indeed, Portugese wine is among the best value-for-money in the world. So, why do they need to import any cheap wine, at all? Answering this question is not easy, because almost all discussions of Portugal and wine are about its exports, not imports (eg. the Wine by Numbers data collection). Finally, China is the fastest growing market. It is currently ranked 6th for price, but is the 5th biggest importer by volume, although that shrinks dramatically when recalculated per person. Until recently, French wine was the most popular product, but Australia is now the front runner by value (Australian wine imports make further gains in China). Indeed, China is now Australia’s highest value export wine market. The distinction between value and volume is important here — until surpassed by China, the USA was Australia’s highest value export wine market, while the UK remains the biggest volume market for Australian wine, Yellow Tail not withstanding (China now Australia’s great wine hope). The British import plenty of bulk cheap Australian wine (Top bulk wine routes in 2000 and 2015), and bottle it themselves, while the USA and China are more interested in the top (already bottled) end of the market.